Well the first thing they need to prepare for is the mass clean-up of hundreds or thousands of bodies………….namely all the kids and millennials that will run around in circles until they die because their cell phones don’t work. I have no doubt massive numbers of people will just sit down and starve to death waiting for the power and their phones to come back on. I’ve seen this movie and ends poorly. IF that came to happen Sand, i’d not shed a tear over the elimination of that many useless idiots. So funny! Probably true, sadly. Telling agencies to do something doesn’t mean they’ll actually do anything — but at least it’s a start, and about time. Eventually the electric car (Tesla) will probably replace the internal combustion engine. That’s fine, but electric cars are especially susceptible to EMP. Elon Musk, you need to fix this problem and make the Tesla EMP-proof. Right now. Still, we need a backup vehicle system. The most resistant vehicle to EMP is diesel. If we get hit by an EMP they will need a bunch of diesel trucks to drive around repairing the grid. Make sure all diesel truck can operate even if the computer modules onboard are all fried in the EMP blast. Make this a law now, and in a few years all diesel trucks will be useful in an emergency. Also work on hardening the underlying grid. Perhaps a “fuse” section of grid that is designed to fail during an EMP and thereby protect the rest of the grid. Make sure the fuse section is in a really convenient place where it’s easy to repair, and there are several fresh fuses stored right there at the base of the structure. If an EMP blows the fuse, you can send a guy up there and replace it in under 30 minutes. Make sure there’s a fuse station every 100 miles or so. This is miraculous. No president has ever taken an initiative to even look into this, even though all have been told of the possibility and vulnerability of our grid. 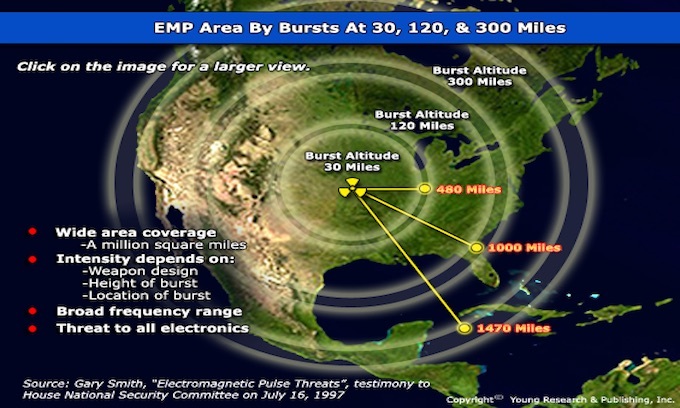 Studies have shown that if an EMP were to take out the entire grid, that 90% of the population would be dead in 2 years! It would bring out the worst in people and many would die from murder. That is pure devastation. Only a small percentage of people know how to survive if the clock were turned back 150 yrs. IT’s only miraculous if these agencies ACTUALLY DO something..